This Quick Parking Brain Teaser is for Kids. In this Quick Brain Teaser, you are shown a puzzle image in which two cars are parked. You have to use your mental ability to calculate on which numbers these cars are parked. Lets see how much time you will take to solve this easy parking brain teaser? Can you solve this Quick Parking Brain Teaser? 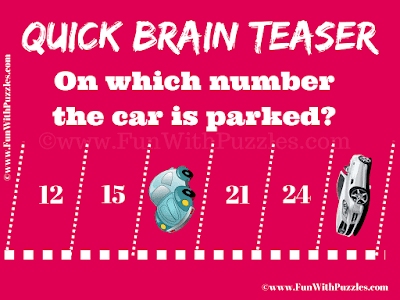 Answer of this "Quick Parking Brain Teaser for Kids", can be viewed by clicking on button. Please do give your best try before looking at the answer. The Answer is 18 and 27. The Difference between two consecutive parking slots is 3.